During this year’s local BarCamp in Darmstadt (for the Rhein-Main area), I also presented a few slides on M-Pesa & M-Kesho which are quite succesful in Kenya since their launch. Safaricom‘s former CEO, Michael Joseph, also talked about the success & struggle that came along with it during his Q&A session at (the) iHub Kenya earlier last month. Afaik, M-Pesa on Safaricom (Kenya, 51% owned by Vodafone) is a Premium SMS based transactional payment system. You can google for M-Pesa and also check YouTube for the various videos on M-Pesa and why it has become so successful in EAK over the last three years (obviously, due to the lack of and need for alternatives). Now, Germany. A country with seemingly more ATMs than public toilets :-), a working payment system, affordable (sometimes free) bank accounts with minimal charges, a cash culture where card-based payment systems are diverse and convenient to handle, but most importantly:the existing mix of cash & cards is an approved system that most often works and doesn’t require much behaviour change. During another session on future mobile apps (during the BarCamp), fellow blogger Kai-Christian asked the attendees about their perception of mobile apps, and what we would like to see being developed. As a hardware guy, I naturally love the idea of gadget add-ons that will turn your iPhone/smartphone into an e.g. medical test device, but when I look at the African market – and that was my main intention when I presented the slides on AfriGadget, Ushahidi, the iHub & Co (= what can we learn & adopt from them? South>North exchange) – I think it’s a very valid question to ask about the lowest denominator: telephony & sms, and why we are foccussing on High-Tech only (as opposed to the long-tail in mobile phone users, ~ 80% on simple phones), and why the market for SMS-based services still isn’t as satisfied as it should be. To me it seems that since 1997, since the introduction of WAP, not much really changed in this sector (in .DE) because everyone was looking for the “killer app”, and this perception only really changed with true internet phones like the iPhone and such. So I asked if a mobile payment system like M-Pesa would be possible in Germany. One of the attendees, Silke (who is an expert on commerce systems and also blogs their usage on her private site), instantly replied that these mobile payment systems wouldn’t be successful in Germany because ppl wouldn’t need them (due to the aforementioned availability of ATMs & alternatives). Software developer & technical consultant with a mobile service provider, Ali Pasha, added another comment to that and explained that there are security issues that come along with using SMS (which is true, because there is no 100% encryption). Given that a lot of Germans are having privacy concerns with Google Street View and objected the publication of street photos (which aren’t that private anyways), security issues are to be taken very serious when it comes to doing business in Germany (and, of course, elsewhere, but Germans seem to be very attached to security issues). No risk, no problem? There are existing mobile payment systems available in Germany (also some upcoming ones based on Contactless NFC right here in Frankfurt), and I also remember the late Paybox service from early 2000 which is now only active in Austria. I don’t know the actual reasons for their failure in Germany, maybe due to investors pulling back or because of a tight competition with banks & providers, or both, but it’s interesting to note that their failure obviously wasn’t due to users who rejected the system, but because of external pressure. I, for one, remember using Paybox as a happy customer. If there is one thing I’ve learned in business, (then) it’s that the best and most accepted solution isn’t always the one that will prevail and succeed. What you see here is a screenshot taken from mpass, a German system run by Vodafone (M-Pesa!) 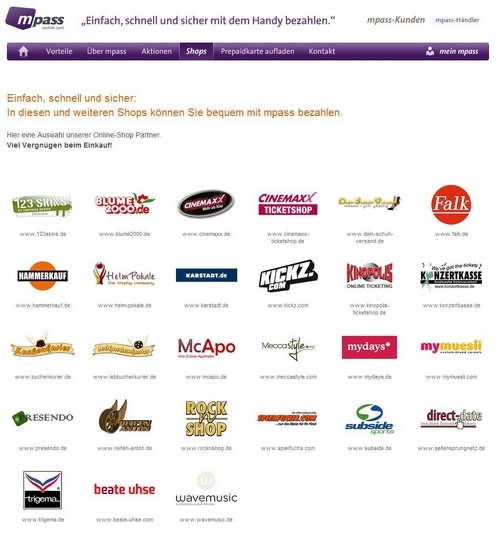 – a list of online shops where you can already pay using mpass. Not too many, if I may say so, and I am sure that mpass isn’t as popular in Germany as it probably should (be). And obviously, mpass isn’t like M-Pesa because it a) isn’t implemented into the SIM (SIM-toolkit) and b) mpass is also only (?) used as an add-on to online shopping, to confirm a payment, while m-pesa provides much more than that (e.g. the direct exchange of credit). Sooo…. if a similar technology is already available, and if they have been “alive” since 2008 – what do you think? Would a mobile payment system (of any kind) be successful in Germany? Would it take a SIM-toolkit modification like M-Pesa to reduce security concerns among German users? I remember having an M-Banking menu item on my old D2/Vodafone SIM card which never worked, and I am not the only one who never understood this. I think one of the main arguments for M-Pesa (from provider perspective) is that users are forced to stick to a SIM (and the network), while mpass works from all networks. Is this due to a European law which regulates, but also limits the competition? I don’t know. But what I do know is that there’s often a different reality to what has been evaluated in field studies, or what we (as interested users) may assume of the market. Just as M-Pesa had been adopted to the Kenyan market by its users – “misused”, if you will. I like that. I’d like to see a similar development in Germany, if only to further explore what’s really possible with basic mobile phone functionality like telephony or sms. As a Kenyan who’s lived in the West for more than a decade, my answer would be a well known American proverb: “If it ain’t broke, don’t fix it.” Nothing’s wrong with the current banking system in the West. The are a good number of options that work just fine probably 99% of the time. Given that online transactions are more secure than SMS, I wouldn’t trade the former for the latter. And now that so many people have internet ready phones, banking transactions can already be completed on the go from the phone. I’ll also say that I think white collar crime in technology is more prevalent in the West, so I wouldn’t take the M-Pesa risk in the West; it would be an unnecessary risk. it’s the over regulated banking system in DE that would prevent this from work as a real cash/cc alternative – it would basically make telco providers a financial service provider as well. I am sure most banks would be against having their slice of the cake made thinner (revenues from transaction fees, interest etc). Also the existing banking infrastructure does work and people feel safe using it (more or less) and as said it keeps banking power in the influential hands of those that hold it now. In africa Mpesa gave a banking infrastructure to people that never had access to financial service (generalisation) thus the banks never lost customer, interest, fees etc. Nut telco’s picked up where the gap was. that gap doesn’t exist in the west (again a generalisation). It could of course work theoretically, but you better leave that battle to the lobbyists of telcos and banks. Ok, maybe the focus or terminology shd be on “mobile payment”, not “mobile banking” – I understand that m-pesa is a payment option and m-kesho a banking option. Or are they both the same? Minda, thx. That’s a good explanation.